It's hard to find sleep-well-at-night companies, but this duo has proved its worth. It's a lot of work keeping tabs on a portfolio of stocks. And while some people enjoy it, many would rather spend their time doing other things. The interesting thing is you can find investments that don't need to be watched over constantly. You just need to be picky. So if you hate checking your portfolio, try ExxonMobil Corporation (NYSE:XOM) and Nucor Corporation (NYSE:NUE). Let's take a look at why these two companies are the ones you can buy and not worry about for years to come. It shouldn't be news to you that the oil and gas industry is struggling today. Stories of bankruptcies and red ink have filled the headlines since oil started to tumble in mid-2014. No company in the industry has been spared. 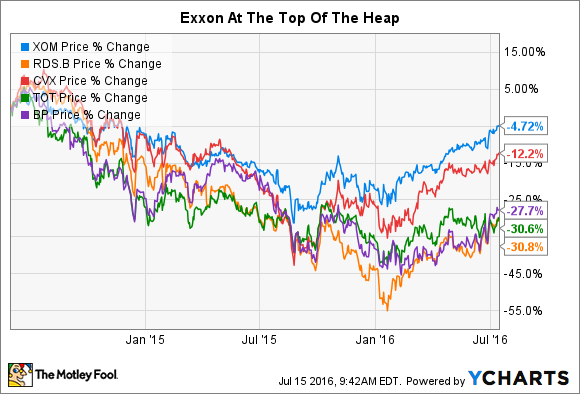 However, there is one that's managed to handle the downturn better than its peers: ExxonMobil. Exxon is one of the world's largest integrated oil majors, meaning it does everything from drilling for oil and natural gas to refining it and, of course, selling you gas. Competitors such as Chevron (NYSE:CVX) and Royal Dutch Shell (NYSE:RDS-B) do the same thing, but only Exxon has managed to hold up better through the most recent industry downturn. For example, since the downturn began, Exxon shares are down just 5% or so, while Chevron is down more than twice as much and Shell a whopping 30%. All three dipped deeper than that at one point, but even there, Exxon's losses were smaller than those of its peers. Now look at dividends. Exxon continues to raise its distribution, while Chevron and Shell have both hit the pause button. Each of the trio has suggested that it wants to protect the current dividend payment, and all are adding debt to keep funding growth plans and dividend distributions. But Exxon's debt levels going into the recession were lower and, even after adding debt, remain the lowest of the trio. Which is one of the reasons that investors have favored the shares. .
Another reason that Exxon has held up so well is the not-so-minor fact that it continues to make money. Chevron has lost money for two consecutive quarters. And Exxon has also been cautious on the acquisition front of late. Royal Dutch Shell just completed a $50 billion natural gas acquisition. That's all in keeping with Exxon's history of being conservative financially and operationally. And it's not that you don't have to think about Exxon as a holding, but it's one that you can check up on a few times a year, and that would probably be enough. Add in a 3.1% dividend yield, backed by over 30 years of annual increases and counting, and there's even more to like. There's a similar story to tell at U.S. steel giant Nucor. This steel mill is highly diversified, has flexible and low-cost operations, and is conservatively managed. That's shown through in the long industry downturn that started at the end of the 2007-to-2009 recession. The steady flow of positive earnings helps explain why Nucor's shares are up nearly 18% since the start of 2009 while U.S. Steel, AK Steel, and ArcellorMital are all down 45% or more since that point. The lone standout is Steel Dynamics, which is up 125%, but its bottom line dipped into the red in 2015 -- not a comforting sign. It's also less than half the size of Nucor and is a relatively new industry player, though it and Nucor have a similar focus on more flexible electric arc furnaces and scrap metal. In other words, younger and smaller Steel Dynamics would probably need more attention than Nucor in your portfolio. 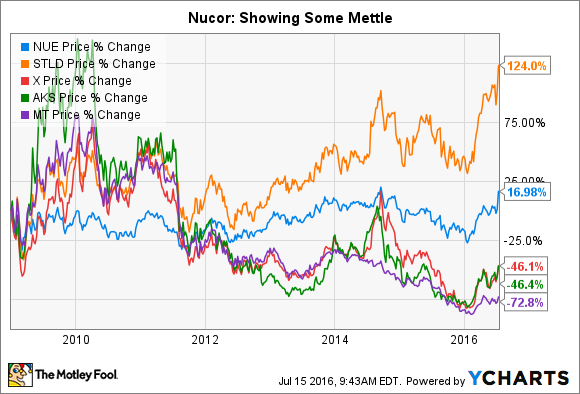 Throw in Nucor's 2.6% yield and an over 40-year history of annual dividend increases, and Nucor gets the nod for a steel company that doesn't require a lot of monitoring. True, it may not have the recovery potential of some of its peers, but it's survived the downturn a lot better, allowing shareholders to sleep at night. So Exxon and Nucor have done better than their peers during the hard times, which speaks volumes about management and, more important, your ability put the stocks on autopilot. If you hate checking your portfolio every two seconds, you should take the time to look at this pair, even though the industries in which they operate are facing notable headwinds. In fact, that could make now a good time to do a deep dive, since the stress test has already taken place and their prices, while holding up better than those of their peers, may still be appealing relative to a broader market that's hitting all-time highs.